• Store in the orginal package. • Do not use after the expiry date printed on the carton or accuhaler label. • The active substance is 50 micrograms salmeterol (as the xinafoate). * The Serevent Accuhaler is a green, circular device in a moulded plastic containing a foil strip with 60 regularly spaced blisters. There is a counter on the top of the Accuhaler indicating how many doses are left. * Each dose is pre-dispensed. This medicine is manufactured by Glaxo Wellcome Production, Evreux, France and is procured from within the EU and repackaged by the Product Licence Holder: Lexon (UK) Limited, Unit 18, Oxleasow Road, East Moons Moat, Redditch, Worcestershire, B98 ORE.
Serevent and Accuhaler are registered trademarks of the GlaxoSmithKline Group of Companies. * Serevent Accuhaler contains the medicine salmeterol. It is a ‘long-acting bronchodilator’. It helps the airways in the lungs to stay open. This makes it easier for air to get in and out. The effects are usually felt within 10 to 20 minutes and last for 12 hours or more. * The doctor has prescribed it to help prevent breathing problems. These could be caused by asthma. Taking Serevent Accuhaler regularly will help prevent asthma attacks. This also includes asthma brought on by exercise or at night. * Taking Serevent Accuhaler regularly will also help prevent breathing problems caused by other chest illnesses such as Chronic Obstructive Pulmonary Disease (COPD). * Serevent Accuhaler helps to stop breathlessness and wheezing coming on. It does not work once you are breathless or wheezy. If that happens, you need to use a fast-acting ‘reliever’ medicine, such as salbutamol. * Serevent is supplied to you in an inhaler called the Accuhaler. You breathe the medicine directly into your lungs. If you are being treated for asthma, you should always be given both a Serevent and a steroid inhaler to use together. xinafoate, or to the other ingredient lactose. * If you are using Serevent for asthma your doctor will want to regularly check your symptoms. not increase your number of puffs of Serevent. Your chest condition may be getting worse and you could become seriously ill. See you doctor as you may need a change in asthma treatment. * Once your asthma is well controlled your doctor may consider it appropriate to gradually reduce the dose of Serevent. * If you have been prescribed Serevent for your asthma, continue to use any other asthma medication you are already taking. These could include a steroid inhaler or steroid tablets. Continue taking the same doses as before, unless your doctor tells you otherwise. Do this even if you feel much better. Do not stop taking your steroid inhaler (or any steroid tablets) when you start using Serevent. * Your doctor may want to check your health regularly if you have an overactive thyroid gland, diabetes mellitus (Serevent may increase your blood sugar) or heart disease, including an irregular or fast heartbeat. * Tell your doctor if you are taking or have recently taken any other medicines. This includes those for asthma or any other medicines obtained without a prescription. This is because Serevent may not be suitable to be taken with other medicines. * Inform your doctor before using Serevent if you are currently being treated for any fungal infections with medicines containing ketoconazole or itraconazole, or if you are being treated for HIV with ritonavir. These medicines may increase the risk of you experiencing side effects with Serevent, including irregular heart beats, or may make side-effects worse. * Beta-blockers should be avoided when taking Serevent, unless your doctor tells you to take them. Beta-blockers, including atenolol, propranolol and sotalol, are mostly used for high blood pressure or other heart conditions. Tell your doctor if you are taking beta-blockers or have recently been prescribed beta-blockers as they may reduce or abolish the effects of salmeterol. * Serevent can reduce the amount of potassium in your blood. If this happens you may notice an uneven heartbeat, muscle weakness or cramp. This is more likely to happen if you take Serevent with some medicines used to treat high blood presssure (diuretics - water tablets) and other medicines used to treat breathing problems such as theophylline or steroids. Your doctor may ask for you to have blood tests to check the amount of potassium in your blood. If you have any concerns discuss them with your doctor. The possible side effects associated with Serevent are unlikely to affect your ability to drive or use machines. * If you are being treated for asthma, you should always be given both a Serevent and a steroid inhaler to use together. * Use Serevent every day, until your doctor advises you to stop. * You will start to feel your medicine working within the first day of use. Serevent is for inhalation by mouth only. * The usual starting dose is 1 puff twice a day. * For people with more severe asthma, your doctor may increase your dose to 2 puffs twice a day. * In children aged 4 to 12 the usual dose is 1 puff twice a day. * Serevent is not recommended for use in children below 4 years of age. * Not applicable for children and adolescents. * Your doctor, nurse or pharmacist should show you how to use your inhaler. They should check how you use it from time to time. Not using the Serevent Accuhaler properly or as prescribed may mean that it will not help your asthma or COPD as it should. 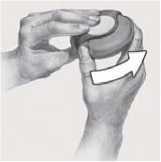 * The Serevent Accuhaler device holds blisters containing Serevent as a powder. * There is a counter on top of the Serevent Accuhaler which tells you how many doses are left. It counts down to 0. The numbers 5 to 0 will appear in red to warn you when there are only a few doses left. Once the counter shows 0, your inhaler is empty. 1. 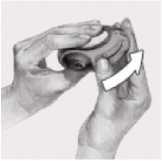 To open your Serevent Accuhaler, hold the outer case in one hand and put the thumb of your other hand on the thumbgrip. Push your thumb away from you as far as it will go. You will hear a click. This will open a small hole in the mouthpiece. 2. 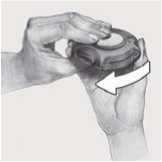 Hold your Serevent Accuhaler with the mouthpiece towards you. You can hold it in either your right or left hand. Slide the lever away from you as far as it will go. You will hear a click. This places a dose of your medicine in the mouthpiece. Every time the lever is pushed back a blister is opened inside and the powder made ready for you to inhale. Do not play with the lever as this opens the blisters and wastes medicine. 3. Hold the Serevent Accuhaler away from your mouth, breathe out as far as is comfortable. Do not breathe into your Serevent Accuhaler. 4. Put the mouthpiece to your lips; breathe in steadily and deeply through the Serevent Accuhaler, not through your nose. Remove the Serevent Accuhaler from your mouth. 5. Afterwards rinse your mouth with water and spit it out. This may help to stop you getting thrush and being hoarse. 6. 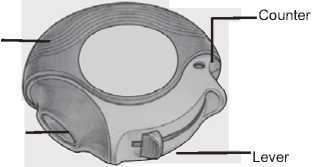 To close the Serevent Accuhaler, slide the thumbgrip back towards you, as far as it will go. Your Serevent Accuhaler is now ready for you to use again. Wipe the mouthpiece of the Serevent Accuhaler with a dry tissue to clean it. It is important to use the inhaler as instructed. If you accidentally take a larger dose than recommended, talk to your doctor or pharmacist. You may notice your heart beating faster than usual and that you feel shaky and/or dizzy. You may also have a headache, muscle weakness and aching joints. Do not take a double dose to make up for a missed dose. Just take your next dose at the usual time. To reduce the chances of side effects, your doctor will prescribe the lowest dose of Serevent to control your asthma or COPD. These are the side effects reported by people taking Serevent. Allergic reactions: you may notice your breathing suddenly gets worse after using Serevent. You may be very wheezy and cough. You may also notice itching and swelling (usually of the face, lips, tongue or throat). If you get these effects or they happen suddenly after using Serevent, tell your doctor straight away. Allergic reactions to Serevent are very rare (they affect less than 1 person in 10,000).